Wednesday, April 6, join your neighbors at Rainier Community Center (4600 38th Ave S) for the American Heart Association's Start Walking Day. We'll be distributing 60 free bike helmets from 11am - 12pm, and walking as a group from 12 - 12:30pm. Celebrate health and fitness! 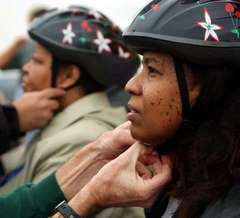 Bike helmet distribution, 11am - 12pm, includes a helmet fitting. Person wearing the helmet must be present. Find us inside the community center, 4600 38th Ave S.
Group walk, 12 - 12:30 p.m., indoor or outdoor options. Bring a friend and commit to being fit, along with thousands of other people around the US. Snacks included. This is a great lunch break activity, and is perfect for all speeds and ages! Meet inside the gym. Sponsored by the Sound Steps Walking Program of Seattle Parks and Recreation. For more information, contact Mari Becker at 684-4664 or vog.elttaes|rekceb.iram#vog.elttaes|rekceb.iram.